Boutique Blends added the Bin No. 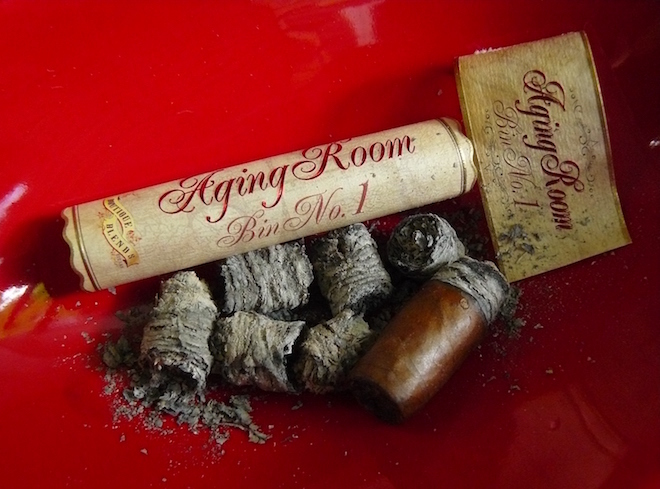 1 to its Aging Room brand in 2014 with three initial vitolas. The next year, they brought out two new sizes, including the D Minor which I will be reviewing here today. Sporting an Ecuadorian Habano wrapper enfolding well-aged Dominican tobaccos from 1999 and 2001, they are produced at Jose “Jochy” Blanco’s Tabacalera Palma factory in the Dominican Republic. The five sizes are B Minor – 6.125 x 52, C Major – 5.25 x 54, G Major – 6.25 x 63, D Minor – 7 x 38, and D Major – 6 x 54 Box Pressed. The first four sizes come in boxes of 20, while the D Major comes in boxes of 18 cigars in individual coffins. Prices run from $10.50 for the D Minor to $14.90 for the D Major. 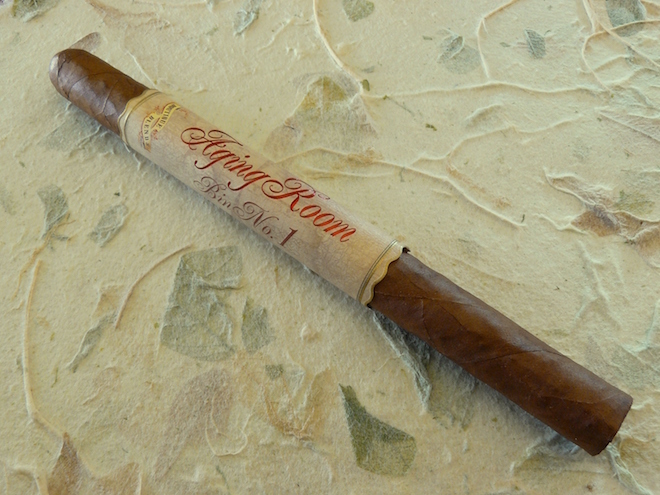 Regarding Aging Room here at Casas Fumando, Jeremy has reviewed the Small Batch M356, and the Quattro F55, while my review of the ROMEO by Romeo y Julieta Aging Room Small Batch F25 can be found here. Suffice to say that what Boutique Blends’ Rafael Nodal has been bringing to market has made a positive impression on us both, so let’s see if the Bin No. 1 holds up to my rather lofty expectations. Cuenca Cigars carries just about everything from Boutique Blends, and you can get the Aging Room Bin No. 1 D Minor here. The Lancero sized Bin No. 1 D Minor comes cloaked in a uniform milk chocolate brown wrapper with fine veins, some very fine tooth, and very tight, nearly invisible seams that lead to a nicely applied triple cap. The roll is firm throughout with just a couple of small slightly spongy spots. 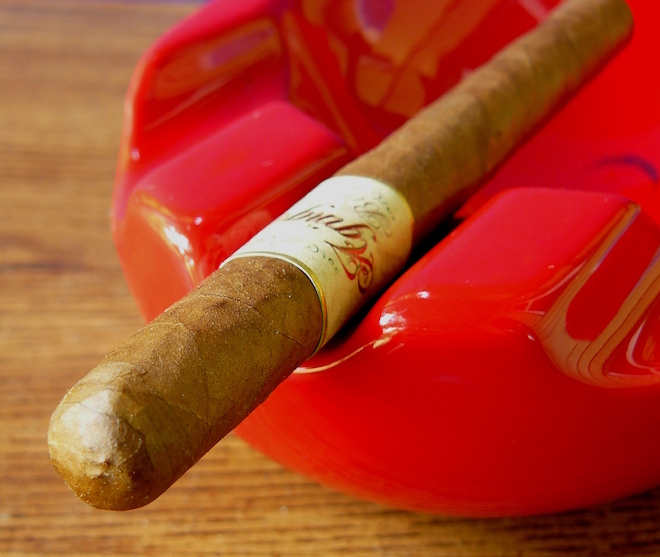 The obvious part of the cigar’s presentation is the huge 3 ¼” sleeve with metallic burgundy lettering on a parchment-like background. I’m happy that the sleeve is wisely applied with tape and not glued on, which allows it to easily slip off to reveal a more conventional 1” long band beneath. The scent off of the wrapper is light earthy barnyard, while the foot is primarily natural tobacco. Clipping the cap reveals a snug draw that features unlit flavors of sweet spice and light natural tobacco and wood. Despite the snugness of the draw, the Aging Room Bin. No. 1 D Minor produces a good mouthful of smoke showing toasty cedar, baking spices, and some bread, while leaving a bit of pepper scratchiness on the back of the throat. The retrohale carries quite a bit more pepper along with a touch of musk. 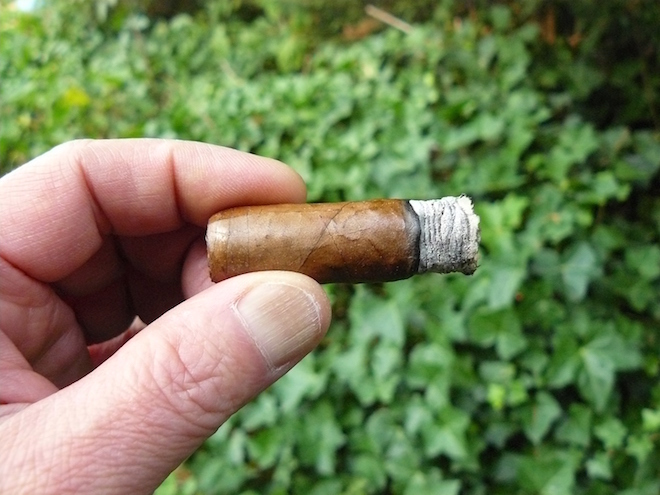 The burn had started out with one good-sized wave to it, but has quickly evened out, as the deceptively compact looking ash falls off into my ashtray a little shy of ¾”, and the pepper has calmed down. A citrusy sweetness has also made an entrance onto the palate, making for quite a nice interplay of medium-bodied flavors, and there has been an uptick in the amount of smooth cedar on the retrohale. By the end of this opening third, the Bin No. 1 D Minor has downshifted to a smooth and relaxing experience. Getting into the central portion of the Bin No. 1 D Minor, all of the previously mentioned flavors continue to drive the cigar, while gaining in intensity. Sweet citrusy spice is even more of a factor, as the cedar and bread lay the foundation, while the pepper anchors the complementary notes. By the end of the second section, the Bin No. 1 has moved past the medium mark and closer to medium-full, while giving a palpable strength kick, though it’s tolerable and probably due in part to the ABV of the beer I’m drinking. The flavors of the Bin No. 1 D Minor just keep getting deeper as it enters its final run, with a sharp white pepper bite joining in. Further down, the toasty wood notes have re-emerged, as the strength also continues to gradually climb. With an inch of cigar left and my lips tingling, I decide to put it to rest, finishing at a medium-full to full body and nearly medium-full in strength. I thoroughly enjoyed the Aging Room Bin No. 1 D Minor for its mix of flavors, top-notch construction and burn, even if it had a draw that was a bit tighter than I tend to like. That ultimately wasn’t a negative factor, as the smoke produced was more than adequate. Due to its strength however, it is not a stick that I would strongly recommend to the nicotine averse or those just starting into cigars. That strength is something I’ve come to notice about a lot of Rafael Nodal’s cigars. The price is certainly in line with what the cigar has to offer in terms of flavors and construction, and I, for one, wouldn’t mind having this one on hand at all times. Melvin Brewing has been producing highly acclaimed beers out of Alpine, Wyoming (!) for several years, and has finally begun distributing their wares here in Washington (their head man is from Seattle – or at least spent a good amount of time here – after all). The 2X4 DIPA is an amazingly rich Imperial IPA showcasing big floral, tropical, citrus, pine, and honey flavors with a smooth mouthfeel and a nice boozy kick due to its 9.9% ABV. Those attributes matched up tremendously well with the Bin No. 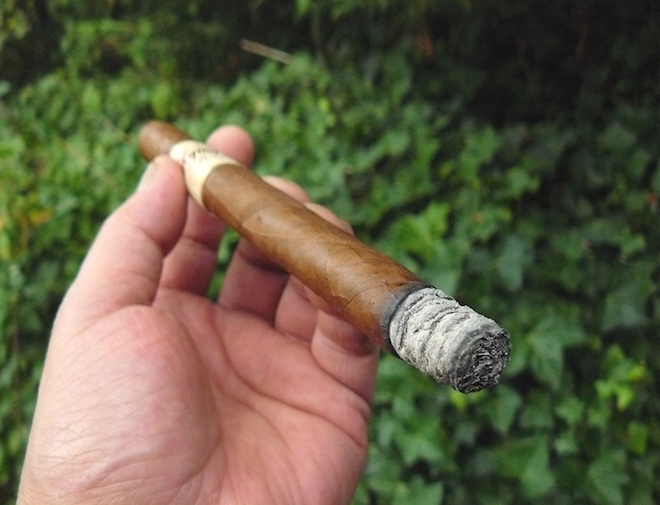 1 D Minor, with the citrus notes bringing out more of the same in the cigar, while the sweetness and relatively low bitterness complemented the smoke as well. A Belgian ale, a sweet run, a smooth Cognac or brandy, or a strong cup of coffee would also be a great match-up for this cigar.